Kardinal and Konig is set in 12th century Europe, where religious orders in the nine most important countries fight and struggle for supremacy. By the use of cards, players found or build monasteries, and bring counsellors to the courts of the Princes. 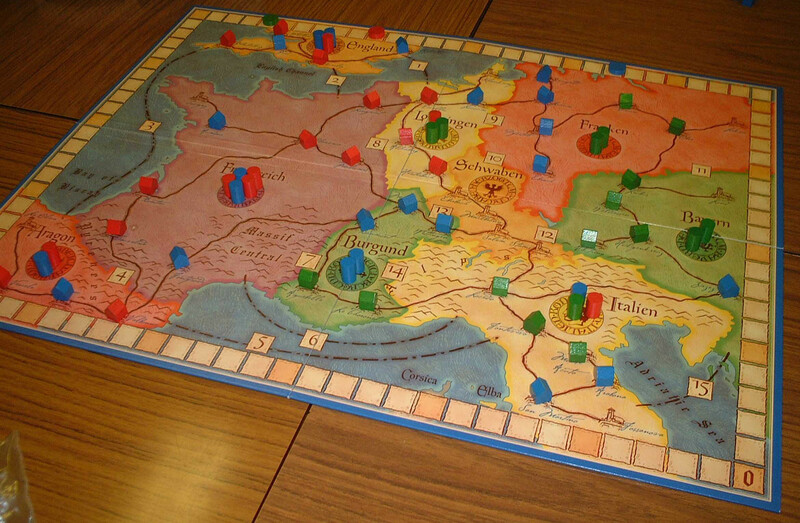 Thus players receive points for the skilful placing of monasteries on principal roads and for the successful alliances between counsellors placed in different lands. By intrigue and strategic placement, players will tighten their web of influence. The player with the most points wins the game. "England in the years 1337 to 1361... The momentous events of the English Middle Ages affect the lived of the inhabitants of Kingsbridge. Here, nearly 200 years ago, Prior Phillip oversaw the building of the imposing cathedral called 'The Pillars of the Earth'. 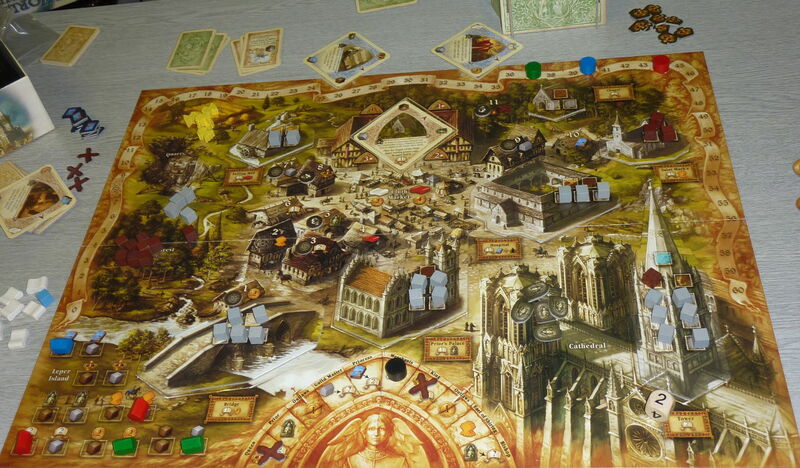 Now, Farmers, wool merchants, and builders-the players-strive for wealth and prestige. In the process, they encounter numerous and diverse characters from Ken Follet's acclaimed novel. The rivalry between the priory and the city merchants colors the turbulent events of the time. Players must strike a delicate balance. You earn victory points for a pious and loyal life, as well as taking part in various building projects. You gain prestige caring for the ill during the plague. However, you stilll must eat before worrying about honor or glory. Difficult times make food and income hard to come by, especially when the King imposes high taxes to finance his wars. Too often, you must keep very little from the money earned at the wool market. Your success may ultimately lie with the favor of important people. Many trades balance life in the 'World Without End'." - English rules.